Rather than building up plastic filaments layer by layer, a new approach to 3D printing lifts complex shapes from a vat of liquid at up to 100 times faster than conventional 3D printing processes. 3D printing could change the game for relatively small manufacturing jobs, producing fewer than 10,000 identical items. That’s because manufacturers could make the objects without the need for a mold costing upwards of $10,000. But the most familiar form of 3D printing, which is sort of like building 3D objects with a series of 1D lines, hasn’t been able to fill the gap on typical production timescales of a week or two. 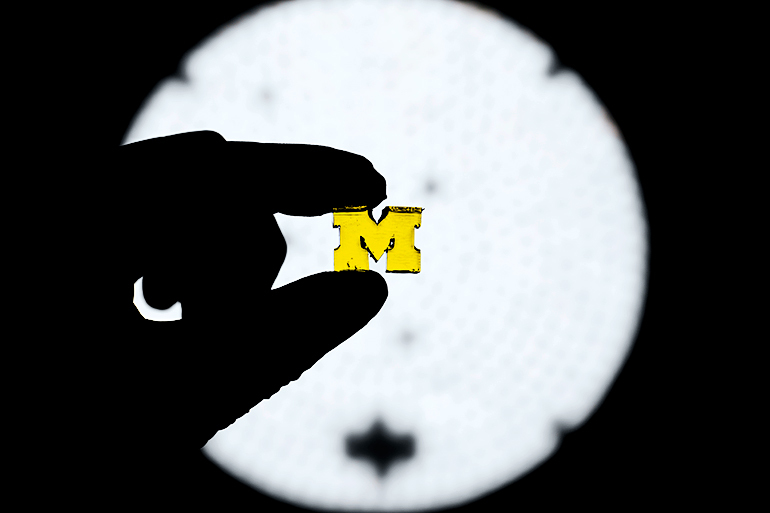 “Using conventional approaches, that’s not really attainable unless you have hundreds of machines,” says Timothy Scott, an associate professor of chemical engineering at the University of Michigan who co-led the development of the new 3D printing approach with Mark Burns, a professor of chemical engineering and biomedical engineering. The new method solidifies the liquid resin using two lights to control where the resin hardens—and where it stays fluid. This enables the team to solidify the resin in more sophisticated patterns. They can make a 3D bas-relief in a single shot rather than in a series of 1D lines or 2D cross-sections. Their printing demonstrations include a lattice, a toy boat, and a block M.
“It’s one of the first true 3D printers ever made,” Burns says. By creating a relatively large region where no solidification occurs, thicker resins—potentially with strengthening powder additives—can produce more durable objects. The method also bests the structural integrity of filament 3D printing, as those objects have weak points at the interfaces between layers. “You can get much tougher, much more wear-resistant materials,” Scott says. But because this gap is only about as thick as a piece of transparent tape, the resin must be very runny to flow fast enough into the tiny gap between the newly solidified object and the window as the part is pulled up. This has limited vat printing to small, customized products that are treated relatively gently, such as dental devices and shoe insoles. By replacing the oxygen with a second light to halt solidification, the team can produce a much larger gap between the object and the window—millimeters thick—allowing resin to flow in thousands of times faster. A paper describing this research appears in Science Advances.